Before we moved into this apartment (almost a year ago) I saw a mini tart pan on sale at Joss & Main and immediately bought it. It arrived right before we moved and although I was tempted to try it out, I kept it in its box and figured I could make something right away once I was settled into the new kitchen. Which apparently took me 11 months. I meant to use it before then, and really did even pull it out the cabinet a few times trying to figure out what I should make, but every holiday I always had some other dessert prepared and the mini tart pan got put back into the cabinet. However, when figuring out what to make for Easter, I immediately thought of the tart pan and knew I was going to use it this time, no matter what. Finding a very simple tart recipe didn’t prove to be as easy though. Everything required much more time than I actually had to prepare one. So, I decided I would just wing it based off some prepared ingredients I had hanging around. Which was genius, if I do say so myself. 2. Cut out pieces of the pie crust to cover the bottom and sides of the mini tart cups. Place the pie crust into each one and press up the sides. 3. Bake for 10-12 minutes or until lightly golden. Transfer to a wire rack and let cool completely. 4. Spoon the Cool Whip frosting into each tart. Top with fruit. Serve immediately. It really doesn’t get much easier than that. I cooked the tarts the night before and let them cool completely before storing them in a plastic bag. I’m not really a fan of prepared frostings, but the Cool Whip commercial is so damn catchy that I ended up buying one just to see what it was like. It’s heavenly, in case you’re wondering. I could easily just eat spoonful after spoonful out of the tub. I highly suggest doubling or tripling this recipe since these were gobbled up immediately. Yummmm!!! 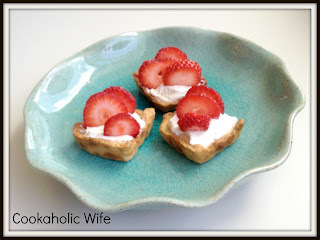 These tarts look amazing!! !